Cyclone Idai has had an impact on Canadian Humanitarian supported students and their families in the programs they conduct in Malawi. While they do not have the capacity to reach out to the country in general, with the direct supervision of their Country Program Manager, they want to bring relief to those that they can reach: our students, their families and communities. Funds you give to Canadian Humanitarian will help to supply food, clothing, medical supplies, and other needed items to their 25 students and their families as they try to make it through this hardship. MCC is present in Malawi, Mozambique and Zimbabwe and has already dispatched a shipment of blankets, soap, hygiene kits, school kits, relief kits and canned meat to Malawi. MCC programming in Mozambique includes construction of wells and sand dams, conservation agriculture, education and vocational training, and health initiatives. Development and Peace – Caritas Canada is working with Caritas Mozambique to come to the aid of over 27,000 of those most affected by this disaster. We are helping to provide basic hygiene and sanitation supplies, kitchen items so people can resume cooking, emergency shelter materials and other life-saving necessities. On March 22, the Samaritan’s Purse DC-8 aircraft left Greensboro, North Carolina, for Mozambique loaded with 27 tons of emergency supplies and a team of disaster response specialists, including medical personnel, to serve its people in Jesus’ Name. Two Canadians are on board the flight and will be serving. Upon arrival in Mozambique, we will use our Africa-based DC-3 aircraft to shuttle them to difficult-to-access areas of the country in order to provide much needed relief. The Government of Canada has launched the Cyclone Idai Matching Fund. 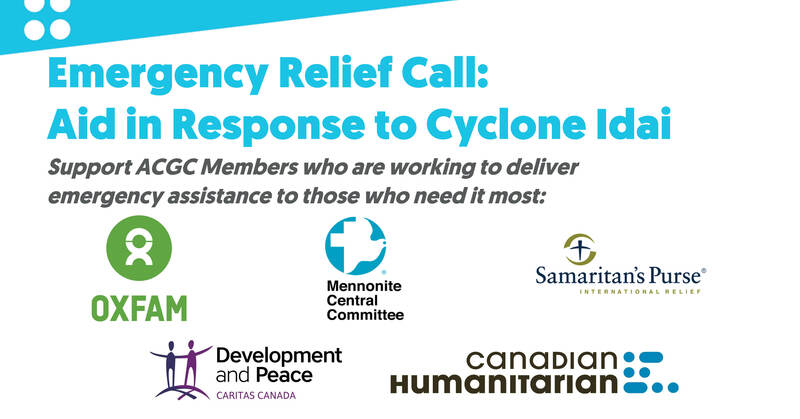 It will amplify the support of Canadians and reinforce the response of Canada’s Humanitarian Coalition and its members as they address the humanitarian needs stemming from the devastating impact of Tropical Cyclone Idai in Malawi, Mozambique and Zimbabwe. For every eligible dollar donated by individuals to the Humanitarian Coalition and its members to respond to the Cyclone Idai crisis between March 15, 2019 and April 14, 2019, the Government of Canada will provide the equivalent to the Humanitarian Coalition, up to a maximum of $2 million. On March 23, 2019 The Honourable Maryam Monsef, Minister of International Development and Minister for Women and Gender Equality, today announced that Canada will provide initial funding of up to $3.5 million in emergency assistance to support humanitarian organizations responding to the devastation caused by Tropical Cyclone Idai in Southern Africa. Canada has also made a donation of humanitarian relief stocks, including tarpaulins, shelter kits, mosquito nets and blankets, to help respond to the immediate needs of the people affected by the cyclone.